Introducing The EOS Help Desk! 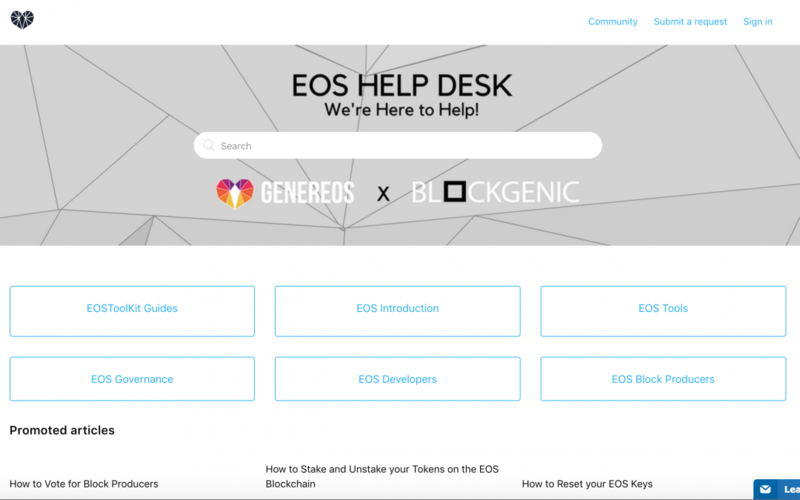 We have teamed up with Blockgenic to create a comprehensive EOS Help Desk for everything EOS related. After building EOSToolkit.io there have been endless requests for technical and non-technical issues that token holders are facing on a daily basis within the community. We try and help as many as we can but feel Telegram and other social channels are not the best platforms to retain information in an easy to find location. At GenerEOS, education is one of our core values. We truly believe that if EOS is going to be widely adopted, we need to share our knowledge and educate as many new people as possible. We felt an area lacking in this department was a “Help Desk” of sorts for our great blockchain. Somewhere where we can post guides and tutorials and users can interact and comment with questions that they have so the information is collated and stored for the next user. We have also included live chat support(when we are online) to immediately help users not only on EOSToolKit.io but users who are trying to perform any task with their tokens or who are just trying to learn. We are hoping to roll out more agents who can help keep live support open for more hours of the day. How do I set up and attach a Scatter account to EOSToolKit? Feedback is always welcome, we hope this adds value.